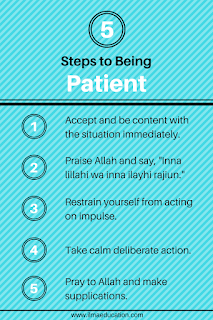 In the previous article 'Why Parents Should Have Patience with Their Child' I explained why parents must have patience whether their child has died or their child has challenging behaviours. In this continuing article, I will show how parents can be patient. 2. Say "Innalillahi wa inni ilayhi rajiun"
Remember that the strong person is one who controls himself. Abu Hurairah (May Allah be pleased with him) reported that the Messenger of Allah, peace be upon him, said, "The strong man is not one who is good at wrestling, but the strong man is one who controls himself in a fit of rage." [Al-Bukhari and Muslim]. To stop yourself from lashing out, try to remain silent. The Messenger of Allaah (peace and blessings of Allaah be upon him) said: "If any of you becomes angry, let him keep silent." (Imaam Ahmad). To help yourself in remaining silent, seek refuge with Allah. Count to ten or one hundred if you have to. Take deep breathes to slow your breathing and calm yourself. Visualise yourself in the serenity of Jannah if you can or surrounded by the tranquility of a deserted beach - whatever image that means peacefulness to you. When you concentrate your thoughts on any of these things, your mind is no longer dwelling on the negativities of the situation and you can then think more clearly of what action to take next. a) focus on emotions. Pinpoint the emotion that your child is feeling and reflect this back to him. You can say, "You're feeling ---(frustrated/angry/sad etc) because ---(rephrase what your child said)." When you do this, your child will feel validated that you've acknowledged his feelings. This could then open up to deep and meaningful conversations. b) use empathy. Concentrate on the behaviour and point out how that affects other people. Ask your child what he can do to make it better. This not only teaches your child to have empathy for others but to get him to take action to fix the problems that he has caused. c) give advice. When your child is ready to listen then give advice on the correct Islamic behaviour. This is not a long lecture but a short and to the point positive action to take. 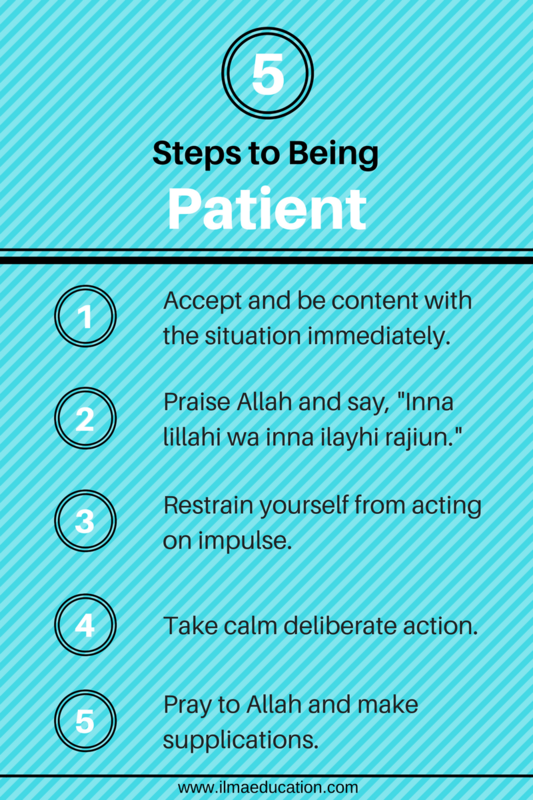 Read how the Prophet, peace be upon him, gave advice here. If your child was taken from you then you can have hope that you will meet again in Jannah, where there will be no sickness and no death. Then strive to do actions that will take you to Jannah. When we have any problems, we always pray to Allah and ask of Allah. Ask Allah whatever you need as the parent's supplication is answered by Allah. (Read more on the power of a parent's dua here.) Make dua for your child and for yourself that you remain patient and pass the test. Wa iyaki sister. Ameen to your dua. Alhamdulillah, I'm glad. It's a reminder to myself as well. I just want to say THANK YOU for posting parenting articles that are based on our true values! Wa alaykum Salam. Thank you for commenting. Alhamdulillah. I believe that all our answers can be found when we apply Islamic principles to them.